TO DESCRIBE Moon Jae-in’s expression as “ashen-faced” would be an understatement. 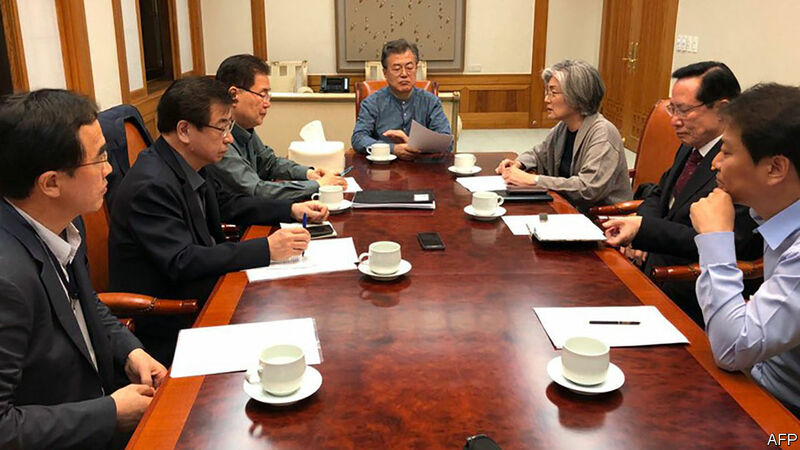 In a photograph released by his office early on May 25th, South Korea’s president (pictured, centre) looked a decade older than his 65 years. The downward turn of his lips suggested that he might be about to cry. The picture was taken at an emergency meeting Mr Moon had been forced to convene late the previous night after Donald Trump, America’s president, suddenly decided to cancel his planned summit with Kim Jong Un, North Korea’s dictator, in Singapore next month. Mr Moon’s face captures the baffled disappointment with which the news of Mr Trump’s decision was met in South Korea. Mr Moon has made the creation of a lasting peace on the Korean peninsula a central goal of his presidency, and was instrumental in brokering the planned summit between Mr Trump and Mr Kim. But he was apparently not informed of Mr Trump’s withdrawal in advance. After hours of silence, he issued a statement saying that he was “perplexed” by Mr Trump’s “very regrettable and unfortunate” decision to call off the summit. He implicitly criticised Mr Trump’s habit of negotiating via bombshell tweets and peremptory statements, saying that he hoped that in future America and the North would resolve their differences “through more direct and close dialogue between their leaders”. For now, the reversal does not seem to have dented Mr Moon’s popularity at home. By early afternoon on May 25th more than 70,000 people had signed an online petition urging their president to “cheer up” and stay the course for peace. Others went further, arguing on social media that the two Koreas should work together rather than wait for unreliable foreign allies to make peace for them. A group of protesters marched to the American embassy, ripping up pictures of Mr Trump.Apparently, Mr Trump decided against warning Mr Moon or other allies of his decision because he was worried about leaks. But his behaviour was nonetheless seen as a snub by many South Koreans, who were already upset by the treatment their president received during his visit to Washington earlier this week. During that meeting, Mr Trump hinted that he might pull out of the summit with Mr Kim, despite Mr Moon’s urging him to stay the course. The tactlessness seemed all the more notable given how unctuous Mr Moon has been in his praise of Mr Trump, despite the misgivings of many South Koreans. Afterwards, terms such as “bad manners” and “diplomatic gaffe” trended on Naver, South Korea’s main search engine. Inevitably, North Korea has tried to seize on Mr Trump’s volte face to paint itself as the more grown-up party, even though it was the North’s threats of a “nuclear showdown” and its denunciation of America’s vice-president, Mike Pence, as a “dummy” that seem to have precipitated Mr Trump’s decision. Indeed, the North seems to have been as surprised as the South that Mr Trump backed out. A statement issued by North Korea’s official news agency expressed “great regret” at Mr Trump’s decision and reiterated the country’s continued willingness to talk. The North’s relatively emollient tone suggests that there remains an opening for the summit to go ahead at a later date and for talks about it to carry on in the meantime. So far, there has been no sign that North Korea will abandon the nuclear moratorium it announced earlier this year. Just before Mr Trump pulled out of the summit, it dismantled its nuclear test site at Punggye-ri in the presence of reporters from five countries including, after initial hiccups, from South Korea. Mr Trump would argue that he is simply driving a hard bargain, following through on his many threats to pull out of negotiations if he thought that the North was not serious. It is certainly hard to argue that Mr Trump should have pressed on enthusiastically given the near-universal scepticism about the North’s intentions. But there is also no question that his abrupt decisions—first raising expectations, by so readily and eagerly embracing the prospect of a summit, and then dashing them, with his unexpected withdrawal—do not fit very well into the ponderous, incremental world of international diplomacy. China, which had been cajoled into joining America’s campaign of “maximum pressure” on the North earlier this year, had already begun to relax its enforcement of UN sanctions in the brief period of optimism that preceded Mr Trump’s disillusionment. A disgruntled South Korea, meanwhile, may try to go its own way if it believes America’s commitment to “permanent peace” to be in question. It is Mr Trump’s comment on May 24th that America’s armed forces were “ready if necessary” to deal with trouble on the peninsula that will most have alarmed southerners. Given his mercurial personality, is it possible, many South Koreans wonder, that Mr Trump might resort to some sort of pre-emptive strike despite the horrendous loss of life that would almost certainly entail. The region seems to be reverting to the fear, uncertainty and division that prevailed before the détente began earlier this year.